The Kamo River is a popular recreation spot for the citizens of Kyoto. You’ll see many joggers, couples, and families along the river bank. 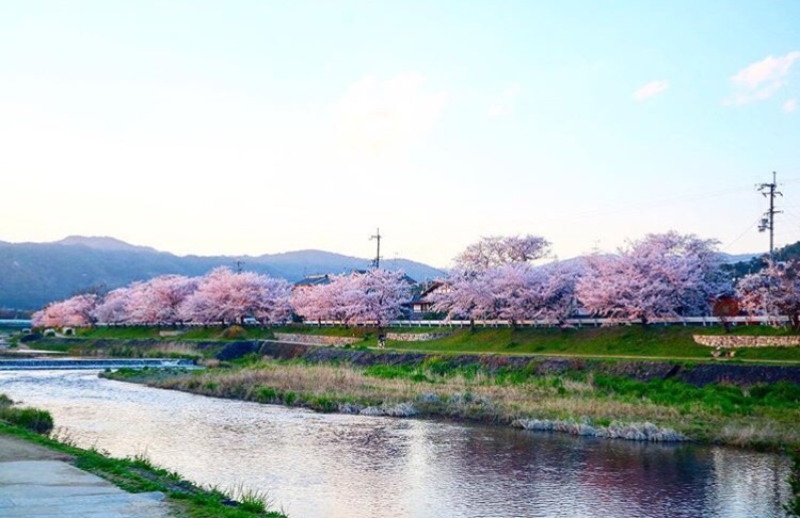 The river is also a good place to see cherry blossoms and many people visit the riverside to admire them. 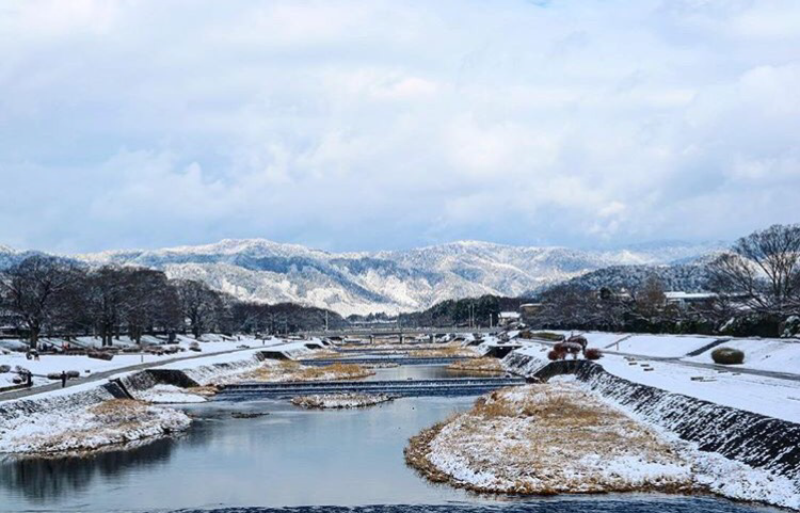 While it is a peaceful area, the Kamo River has been overseeing the history of Kyoto for 1,200 years. The Shijo Bridge, near the entertainments district, is over the lower part of the river. On its east side is Gion, famous for Minamiza Kabuki Theater, the birthplace of Kabuki. North of Gion is the Sanjo Bridge whose rails have a sword mark said to have been inflicted during the Ikedaya Incident (1864). Walking along the river, you’ll often spot fish swimming in the river and seagulls flying up above. Walking here you can feel the history of Kyoto while taking a leisurely stroll. The Shijo Bridge connects the Gion area with Kawaramachi, a busy shopping area. If you cross the bridge and head straight toward Minamiza Theater, the birthplace of kabuki theater, is on the right and Yasaka Shrine at the end of street. 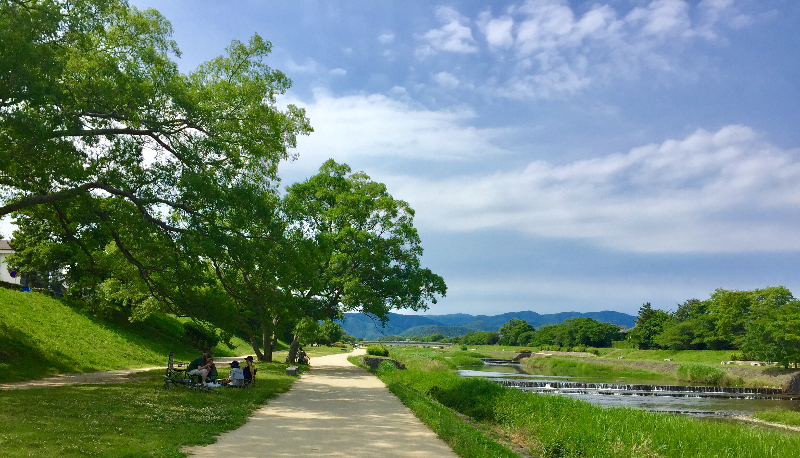 The river banks under the bridge are hot spots for people taking walks or couples on a date and popular as a recreational area for both tourists and Kyoto residents alike. Enjoy your time along the river. The Sanjo Bridge comes into view as you walk north from the Shijo Bridge. What I’d like you note is the black mark that looks like a thin eye on the upper part of the bridge’s second pillar, counting from the west. It is said that the mark was made by a samurai sword during the Ikedaya Incident (A special government police force called Shinsen-gumi attacked the Choshu and Tosa clans) in 1864. That is history right here in Kyoto. Head to the north for about three kilometers from the Shijo Bridge, and you will find a triangular island. It is located on the south side of Shimogamo Shrine. The riverbank has public benches, and on sunny days, the area is lively with people enjoying picnics. The left and right banks of the island shaped like the Greek letter delta are connected with stepping stones, which is a much-loved attraction, enjoyed by both children and adults crossing the river, back and forth. You’ll see such animal shaped stones as turtles and plover birds on the way, so you’ll probably want to stop to take a picture. During the summer season (May 1st–end of September), the restaurants along the Kamo River set up yuka (riverside outdoor dining) and serve meals. This is a Kyoto summer tradition that has continued since the Edo era (1603–1868). There are more than 90 yuka for the 2 kilometer stretch starting from the Kyoto Imperial Palace at Nijo Street to Gojo Street. The height and appearances of the yuka are standardized in order to make for a uniform look. While eating and drinking are permitted along the banks of the Kamo River, you are expected to take your rubbish home with you. I am sure that you want others to have good memories of this beautiful natural space. The Kamo River is a place I, as someone who lives in Kyoto, really like it. There are many bars by the river close to Kawaramachi, but when you head north toward Shimogamo Shrine the road by the river gets wider and nicer to walk on. The river looks different each season, and I really like to walk by the river! 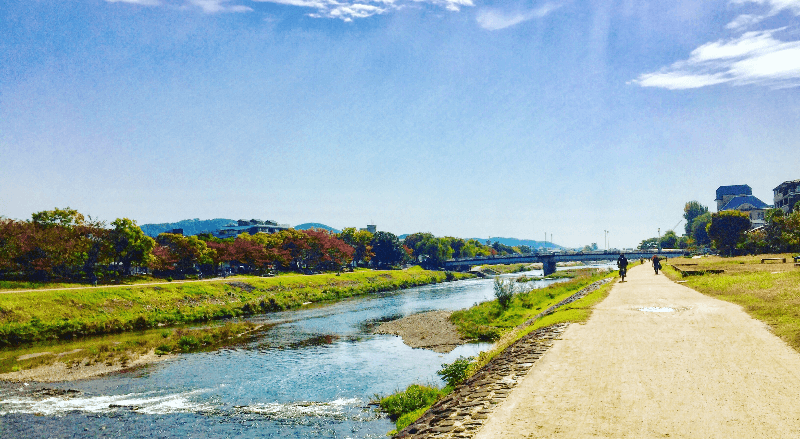 The Kamogawa River is an oasis for the people of Kyoto. In the mornings you can see locals taking walks by the river. The river changes its face according to the season and in the summer it is possible to eat dinner by the river at the "yuka" restaurants. All locals have been to the Kamogawa River. I recommend Kamogawa if you just want to relax. ・Shijo bridge: 1 minute-walk from Keihan Line Gion Shijo Stn. ・Sanjo bridge: 1 minute-walk from Subway Tozai Line Sanjo Stn. ・A Delta: 1 minute-walk from Keihan Line Demachiyanagi Stn. ・Yuka: It is recommended to walk from the Gion Shijo or Sanjo Stn. since the main area is around there. A place where you can enjoy a sense of unity with nature. It's also a good place to visit after temples close. Some Information boards are available in English.